Indoor air quality problems have soared since the late 1970's when construction technology succeeded in developing energy efficient "tight" houses. Pollutants inside houses, which once escaped through cracks around windows and doors, are now trapped inside creating an indoor environment that is often 2 to 5 times more polluted than outside. Pet dander, mold spores, dust mites, allergens, tobacco smoke and other pollutants add up to poor indoor air quality. Fantech's line of IAQ Products can help you solve these problems through better ventilation. Choose from a complete line of Heat Recovery and Energy Recovery Ventilators to bring fresh outside air into the house while expelling stale polluted air. Fantech SHR Series Heat Recovery Ventilators are high performance, low maintenance units designed to improve indoor air quality and provide balanced ventilation in residential applications. Units include many installer-friendly features - easy-slide core guides, external electrical box, easy-access doors, and much more. The HRV brings in fresh outdoor air and draws it through a aluminum core where it is heated by the stale outgoing air. The HRV then distributes the preheated fresh filtered air throughout the home by direct ductwork installed specially for the HRV or through the ductwork of a forced-air system. HRVs/ERVs are typically sized to ventilate the whole house at a minimum of .35 air changes per hour. To calculate minimum CFM requirements, simply take the square footage of the house (including basement) and multiply by the height of the ceiling to get cubic volume. Then, divide by 60 and multiply by .35. CASE: 22 gauge galvanized steel. Powder coated finish, antique white. 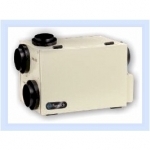 Insulated with 1" (25 mm) high density polystyrene foam to prevent condensation and meet the requirements of the Underwriters Laboratories 94HF. MOTORS: Two (2) German-engineered, factory-balanced ebmT motors with backward curved blades. Motors come with permanently lubricated sealed bearings guarantee long life and maintenance-free operation. Seven (7) year warranty. FILTERS: Two (2) Washable Electrostatic Panel Type Air Filters,11.75" (298mm) x 15" (380mm) x 0.125" (3mm). CORE An aluminum heat recovery core configured for an efficient cross-flow ventilation. Core is 12" x 12" (305 x 305 mm) with a 15" (380 mm) depth. Cores are manufactured to withstand extreme temperature variations. CONTROLS: External three (3) position (Low/Stand By/Medium) rocker switch that will offer continuous ventilation. AIRFLOW BALANCING: Screw type dial on electrical box allows supply airflow to be adjusted to match exhaust airflow. DEFROST: During the defrost sequence, a motorized damper temporarily blocks the incoming fresh air stream so that the warm air from the house can circulate through the HRV. The exhaust blower shuts down and the supply blower switches into high speed to maximize the effectiveness of the defrost strategy. During this cycle, household odors from the kitchen or bathroom are prevented from entering the home and the unit will not create negative pressure. INSTALLATION: Unit is typically hung by using installation kit supplied with unit. Mounting bolts provided on top four (4) corners of unit. SERVICEABILITY Core, filters, motors and drain pan can be easily serviced through latched access door located on front of the cabinet. Core conveniently slides out with ease on an improved railing system. Electrical box, placed on the outside of the unit, can also be easily accessed. POWER: 120 VAC, 1.9 Amps, 150 watts on high speed.